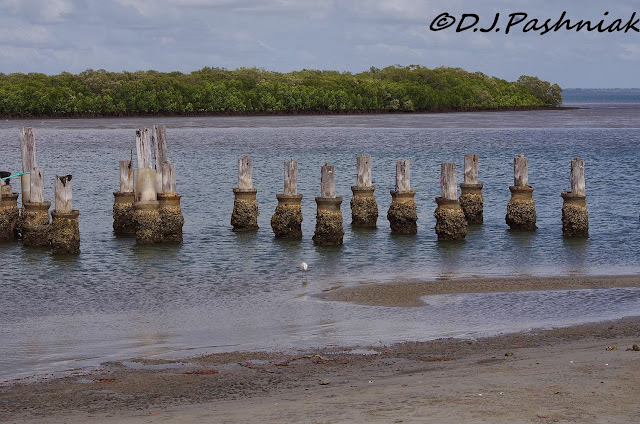 This is all that remains of the Bullock Point Jetty. It was built in the 1960's for a company that was sand mining on Fraser Island for the minerals Rutile and Zurcon. Sand mining on Fraser was stopped in the 1970's and the jetty was used only occasionally from then on. Finally it was deemed too dangerous and in 2010 the main jetty structure was removed. Now, only the birds use the old posts. 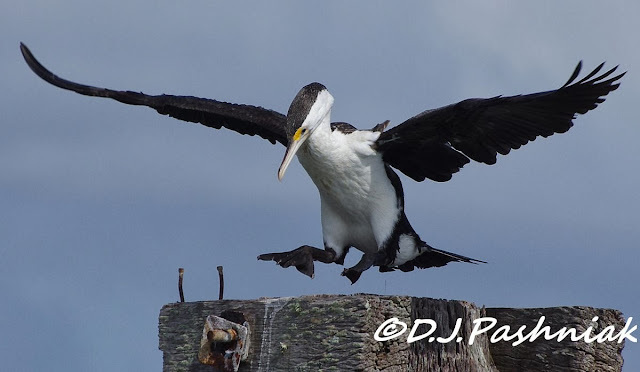 When I was out there the other day this Pied Cormorant was deciding where it wanted to perch. 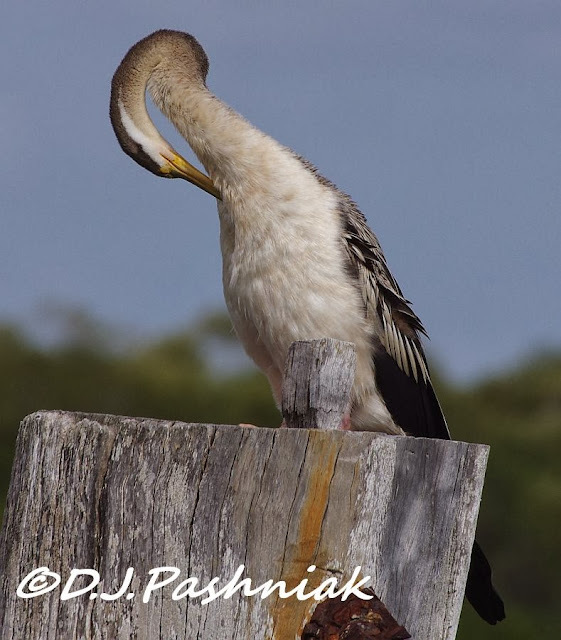 Eventually it sat on a post right next to this female Australian Darter (Anhinga melanogaster). 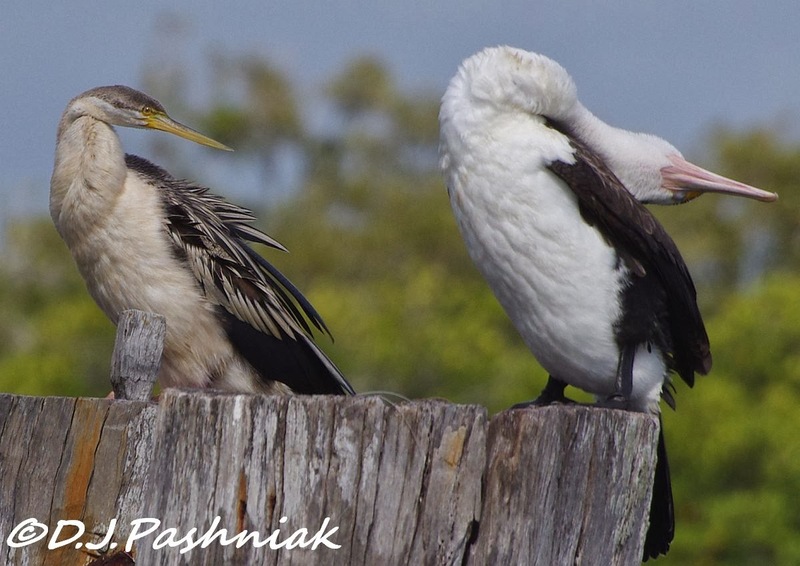 The Cormorant proceeded to preen its feathers from every possible angle while the Darter looked on. Then the Darter did some preening as well. However, it really looked as if the last word was with the Cormorant! and for more birds visit Wild Bird Wednesday. Love seeing the birds from your continent. Wonderful photos! 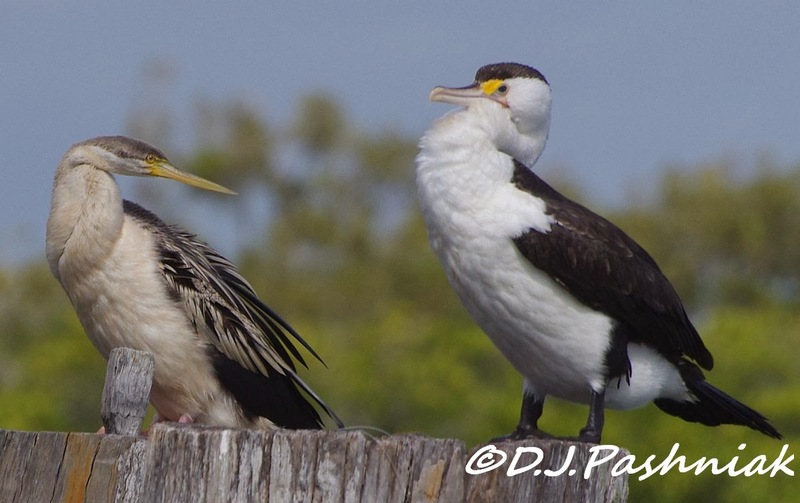 I just love your Pied Cormorants, they are so cute. Great shots, love the shot with the Darter. Oh, your birds are so beautiful, Mick!! And what wonderful captures! I love them all!! They seem to be preening in time to music -- and together!! Terrific! Thanks for sharing and for the smiles today!! Beautiful Action Shots. You were in the right place at the right time. 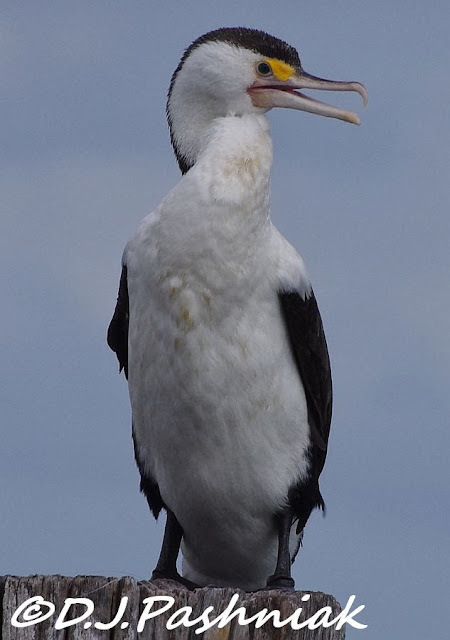 Amazing shots of the cormorant! Looks as though the jetty is sprouting trees. Great photos of preening birds. Every time I see photos of these that WBW bloggers share, I get so darned jealous!!! They're remarkable. That's a great series, Mick! Great quality photographs of a couple of birds with super personalities. The remains of the jetty looks like a great place to hang about to see what will come to perch. Beautiful photos of these gorgeous birds. Fantastic shots Mick. 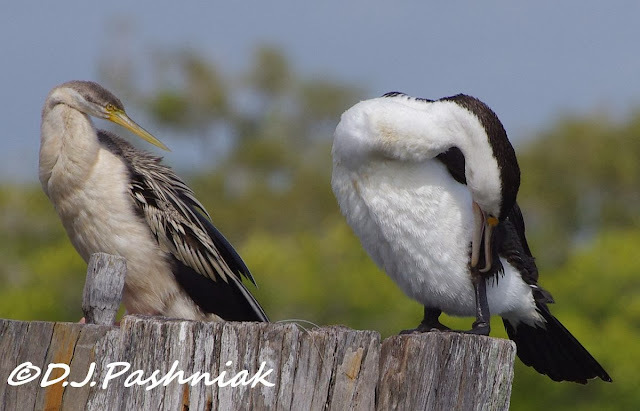 To me, and as a student of evolution, the obvious thing in your pictures is the difference in bill shape, size and structure between the darter and the cormorant. These are fabulous shots! Love the two birds sharing the same post! Great action shots, Mick. And then, your good closeups of the two trying to be good neighbors just made me smile. Such characters! 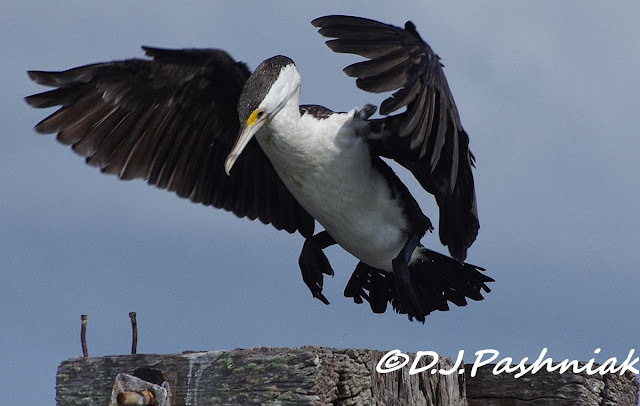 stunning detailed images of this lovely Cormorant sp, brilliant post. gorgeous and fun shots. Love it! 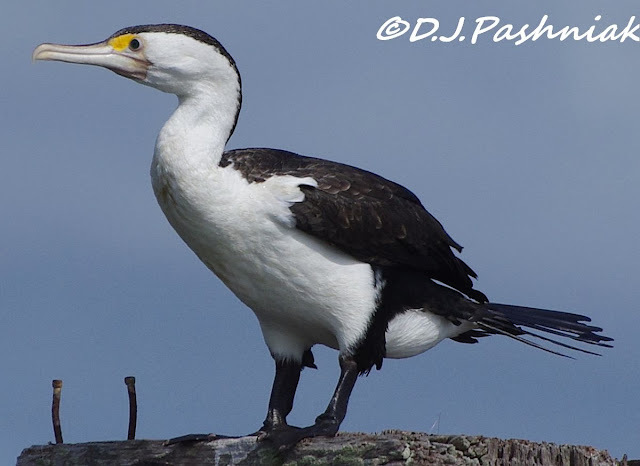 The Pied Cormorant is a beauty. Great shots! The posts make a good setting. Fantastic photos, especially the landing photo! Hi. Wonderful series of shots and commentary to go with it. great. Nice looking birds - where would our seabirds be without old posts! That is an amazing landing shot! Obviously it was the hour set aside for personal grooming! We have anhingas and cormorants here, but a little bit different looking of course. A great series of Cormorant shots.